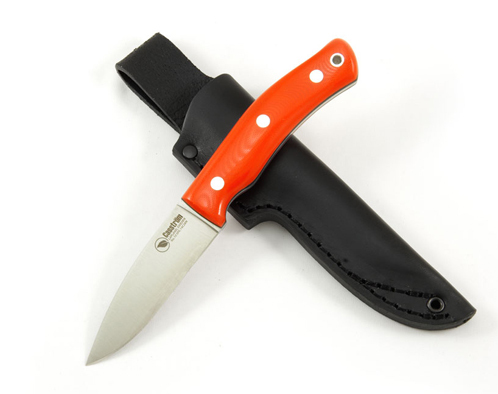 This great new knife is built as a multipurpose knife for hunting, bushcraft and general use in the great outdoors. The blade is 10cm long and made using 3,6 mm thick Swedish 14C28N stainless knife steel and heat treated to achieve a hardness of 57-59 HRC. The knife is ground with a shaving sharp full flat grind and have a satin finish. This steel in combination with the grind makes these knives very effective for multipurpuse use, very strong, yet very easy to sharpen and it takes a great edge.